Along with her brave story, her long history and exposure, Katie Piper is a wonderful spokesperson and especially encouraging. Her enthusiasm to make a difference and her strong personality makes her the ideal spokesperson for any cause. If you're interested in a TV personality spokesperson for any radio or TV interviews please get in contact with us. Kate "Katie" Elizabeth Piper (born 12 October 1983) is an English philanthropist, television presenter and former model from Andover, Hampshire. Piper had hoped to have a full-time career in the media, but in March 2008 sulphuric acid was thrown in her face. The attack, which blinded Piper in one eye, was arranged by Piper's ex-boyfriend Danny Lynch and carried out by an accomplice Stefan Sylvestre; both men were arrested and are serving life sentences with the possibility of parole in prison. The attack took place in North London and Piper was treated in Chelsea and Westminster Hospital, where the surgeons removed all the skin from her face before rebuilding it with a skin substitute and then a skin graft. The procedure was the first of its kind to be completed in a single operation. Katie also underwent Ex-vivo limbal stem cell allograft transplantation (EVSCALT) at the Centre for Sight to restore her vision. In 2009, Piper chose to give up her anonymity in order to increase awareness about burn victims. 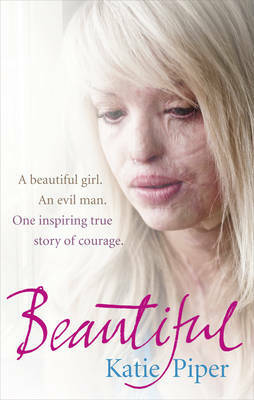 The Channel 4 documentary Katie: My Beautiful Face was first aired on 29 October 2009 as part of the Cutting Edge series; it has subsequently been repeated on several occasions, made available for online on-demand access and sold internationally. More recently, Piper has appeared in follow-up series for Channel 4, released a best-selling autobiography, and had a regular column in weekly magazines. She also presents the Channel 4 television series Bodyshockers about members of the public about to undergo body-altering procedures and those who regret procedures they have had. However, she primarily works for her charitable organisation the Katie Piper Foundation. Piper subsequently began a career in modeling; she took part in various fashion, glamour and promotional photoshoots during her career, including modelling for national newspapers. Piper also entered competitive beauty pageants and contests; she was the 2nd runner-up in the Miss Winchester 2006 beauty pageant, and took part in Maxim magazine's Little Black Book contest in 2006. Piper also began work as a promotional model – appearing and carrying out publicity duties at live events, such as working as a ring-card girl at martial arts fixtures. It was through her work as a ring-girl that Piper became known within the MMA (mixed martial arts) community. Piper also conducted a career as a digital television presenter, working principally on web-TV shows and features, and on small digital television channels, primarily in the shopping and live-chat fields. As her career began to develop, Piper moved away from her family home in Hampshire, and began to live with friends in a flat in the Golders Green area of North London. Katie Piper has appeared on a number of television and radio programmes to talk about her experience; the Australian series 60 Minutes featured Piper in November 2009. In the same month, she appeared on Channel 4's Krishnan Guru-Murthy-hosted television-led debate The TV Show to discuss the reaction to the original documentary. Piper has also appeared as a guest on a number of British magazine and news programmes including Live From Studio Five, Woman's Hour, BBC Breakfast and This Morning. Outside the UK, Piper has appeared on broadcasters including CNN. Katie Piper appeared on The Michael Ball Show on 6 September 2010, and Lorraine on 7 October 2010. On 3 November of that year, she appeared in a Norwegian talk show called Trude. on TV2. Around the time of the broadcast of Katie: My Beautiful Friends, Piper appeared on a number of magazine and features programmes to discuss the series, in some cases accompanied by one of the ambassadors; these appearances included This Morning (with Adele), The Vanessa Show (with Amitish), Fern (with Kayleigh), OK! TV and Loose Women (Piper alone). Piper also appeared on BBC Radio 5 Live with Chantelle as guests of Phil Williams (sitting in for Victoria Derbyshire), but prior to their going on air Chantelle was insulted by a security guard at the studios, an incident which was subsequently referred to by Williams on-air during the interview.